Against the backdrop of the beloved castle town of Inuyama City in Aichi, Pâtisserie La Mieux is a renovated heritage home that boasts a loyal base of regulars, local or otherwise, despite its once-a-week operating hours. It’s owner-chef, Kyoko, graduated with a Pastry Diploma the Kobe school in 2013. Kyoko was a regular office worker, but she made home-made pastries for her friends and family. Bringing smiles to their faces with the things she made, she realized this was her dream. With the notion of making pastry her life in mind, she restarted her career. It was during her time helping at a cake shop that she became painfully aware of her lack of skill. To produce the best pastries, she went to the Kobe school to learn the art of authentic pastries. Completing pastries within an allotted time was tough, and the pressure and anxiety was so much that Kyoko couldn’t eat properly. However, reflecting on her time at school, she strengthened and developed her ability to make split decisions and react instantaneously within the strict conditions of class, drastically improving her pastry technique in a short amount of time. In fact, before enrolling at the school, Kyoko had already purchased the heritage home, ready to open her pastry business. “My goal was clear, so I was very serious about learning,” Kyoko says with a laugh. 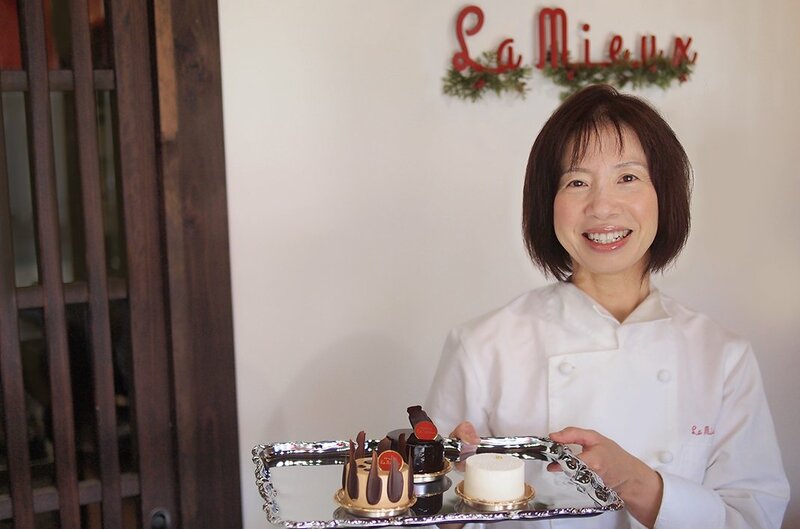 When Kyoko embarked on her pastry journey, she was 40 years old. However, she doesn’t regret her supposed career detour. “Looking back, everything I’ve done feels like it led up to this. I’m still using what I’ve learned in the past now. What’s important is that strong feeling of wanting to do what you’re doing, and I’ve realized that it doesn’t matter when you start,” remarks Kyoko, now living her dream every day. Are you happy you chose Le Cordon Bleu? Le Cordon Bleu teaches you everything you need in Pastry. There’s no other learning environment as comprehensive. Completing a cake from the beginning by yourself, visualizing recipes, techniques, organisation in a kitchen and working effectively are all things you learn. And it’s thanks to the school that I’ve made great new friends. How are you using your experience at Le Cordon Bleu in your work now? When I’m stuck doing new pastries or improving recipes, I think back to what chefs in school used to say and look over old recipes from school for hints. What keeps me going are all the basics I’ve learned from Le Cordon Bleu. What would you say to those considering Le Cordon Bleu? Even if you’ve never held a whisk before enrolling, you’ll be able to make your own original cake, understand the tricks of chocolate, and make pulled sugar after graduating. This is all you’ll be taught at the school and in that environment, you’ll be immersed in it, and as a result you’ll become closer to being the person you dreamed of wanting to be.